2018 is the fifth year Hansen’s is proud to offer these two education funds in their memory to assist our employees and their children to reach their higher education goals and build the most successful future possible for themselves. This year we received 7 applications submitted for only 2 scholarships, each one impressive. Isabelle is finishing her second year at Laval University, in their medical program. Isabelle is the daughter of Claude Marquis, one our Montreal based Car haulers. Samarika will continue her education at Ryerson University, pursuing her degree and going on to become a Chartered Professional Accountant. Samarika is the daughter of Sahil and Neelam Dhiman from our Accounting Department at Head Office in Toronto. Each will receive $5,000 to support their educational goals in 2018. 2016 is the third year Hansen’s is proud to offer these two education funds in their memory to assist our employees and their children to reach their higher education goals and build the most successful future possible for themselves. Caitlin has been accepted to Carleton University in Ottawa, where she will be studying Humanitarian Aid. Caitlin is the granddaughter of Maire (Myra) Campbell. Isabelle will begin her post-secondary education at University of Sherbrooke, Quebec, where she will study Occupational Therapy. She intends to go on to become a medical doctor. Isabelle is the daughter of Claude Marquis one of our Montreal based car-haulers. Each will receive $5,000 to support their educational goals in 2016. 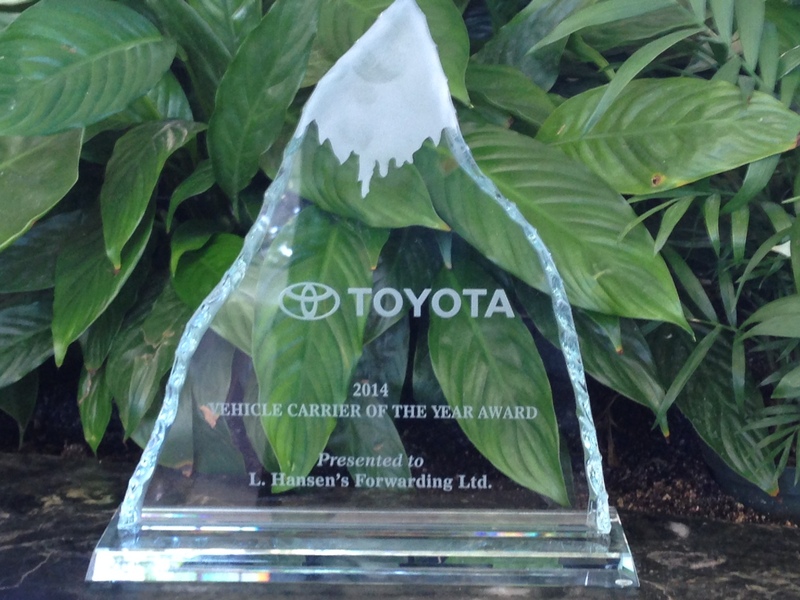 Hansen’s is extremely proud to receive the Toyota Carrier of the Year Award for the 2nd year in a row. Thanks and Congratulations to all of our dispatchers and drivers who work hard everyday to ensure Safe, On Time, Damage Free delivery. This is the 5th time we have received this prestigious award. 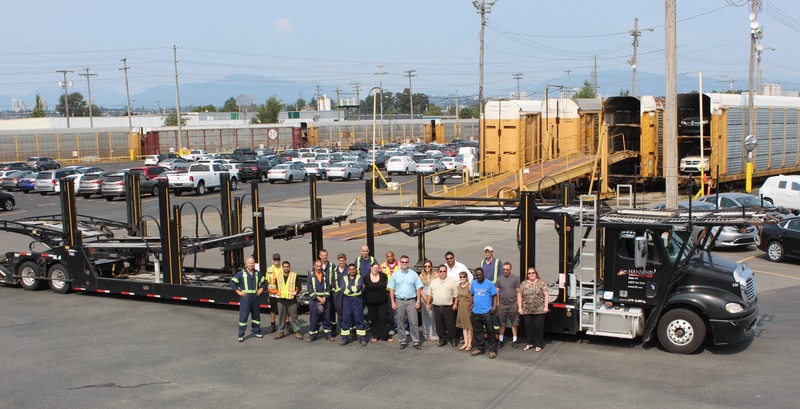 Carrier of the Year program considers rail, marine, parts and finished vehicle carriers. Hansen’s has 7 locations across Canada, including a branch in Vancouver British Columbia. We caught up with the Vancouver staff to discuss the shipping industry, what’s in the works, and what we have to look forward to in the near future. What’s the best part about servicing your community in Vancouver? Tough question… helping people who may end up becoming your neighbours. Every once in a while get to speak to a customer from the same home town and can chat a bit. Connections. What do you enjoy about the shipping / relocation industry? Dealing with a wide variety of people, businesses, and industries. learning the shipping business. Who would of though that Grade 10 geography would actually become a practical skill? Where do you see car shipping and vehicle relocation going in the next 10 years? More environmentally friendly technology, hybrids, electric cars, fuel efficiency gains. What’s your fast growing service / route? What new and exciting changes do you have planning for the coming future? New office! New HandHeld computers for the drivers. What new technologies are adding value to your customer relationship? HH’s, Peoplenet (can tell customers exactly where a driver is), TMS tracking online, Google streetview. What’s your favorite feel-good shipping story this year? Amateur sport sponsorship: Peninsula Speed Skating Club in Victoria. Glenn Schwarz of Jim Pattison Group kids participate in the club. Generally speaking, helping customers daily through a portion of stressful move. Taking car of the car move and communicating every step of the way helps them worry about one less thing during the move. How will you give back to the community this year? We are considering a food drive, collecting non-perishables to support the Vancouver Food Bank. At Hansen’s, we are dedicated to green transportation. We believe going green is more than just reducing idling time and improving fuel efficiency, it’s about exhausting all avenues to achieve environmental sustainability. Here are 10 ways we are going green. Hansen’s has invested in greener engines. While these engines are more expensive to service, they allow us to use low sulphur fuel that will enable the advanced pollution controls to remove more than 90% of the fine particles. We regularly service our fleet to maintain the reliability of our equipment and the efficiency of our engines. Regular engine tune-ups are performed to ensure maximum performance as well as cleaner fluids and filters, which result in cleaner exhaust. The average age of the Hansen’s Fleet is 3.5 years. Hansen’s has set its tire pressure at 110kpa to maximize our fuel mileage, reduce tire wear, reduce costs and improve safety for the driver. Our drivers ensure correct pressure during pre and post trip inspections. Our electronic log books allows for accurate driver compliance ensuring we remain infraction free (DOT, CVOR) and saves an average of 20 minutes a day, meaning the trucks do not run as long. Our speed limiter is set to a top speed of 105 km/h in Ontario and Quebec and 107km/h in the West. These settings provide a major environmental benefit conserving fuel and helping us track fuel consumption for each unit allowing us to better manage our fleet. Hansen’s has a strict idle policy that encompasses initial warm up times that are not to exceed 10 minutes. As well, the engine must be turned off after 5 minutes when we are loading or unloading units. At the end of a shift our trucks will idle no longer than a minute to satisfy the necessary cool down requirements. Hansen’s state-of-the-art computerized operating system provides increased efficiency in all of our departments including: Dispatch, Accounting, EDI and Maintenance. Our wireless, handheld computers eliminate most of the current paper currently used for delivery receipts, load sheets and inspections. Excessive idling is eliminated when drivers are sleeping with in-cab heaters which draw low amounts of power, significantly reducing fuel consumption. We have switched the lubricating oils used on equipment posts and sliders on our trucks from a petroleum based oil to environmentally friendly Canola oil. We are currently investigating which hydraulic fluids will best suit our needs as these types of fluids are considered even more environmentally friendly.